A MOO Digital Marketing Agency Melbourne Intranet Project. Effective marketing and communications isn’t just external efforts focussed on acquiring, retaining and growing new customers. Internal marketing that engages staff and aligns your employees with the broader business objectives is equally important. Intranets are designed specifically for this purpose; internal communication. They provide valuable tools and information that employees need to be productive. Intranets are designed to share useful, informative content — just like the best content marketing websites do. The Content Marketing Institute has a number of articles and studies on this topic. One of our favourites can be read here. MOO has significant experience in the effective design and launch of Intranets for SMEs. Due to the number of stakeholders involved, it requires broad based project planning and delivery skills as well as significant marketing savvy. MOO provided assistance with the selection of an appropriate third party software vendor based on consultation with the various stakeholder groups. For WorkFocus Australia, a raft of information and tools for employees was required and these were placed logically within the sitemap to be easy to find. The various sections were carefully designed to be engaging for the various demographics of the workforce and to reinforce the broader organisational culture. 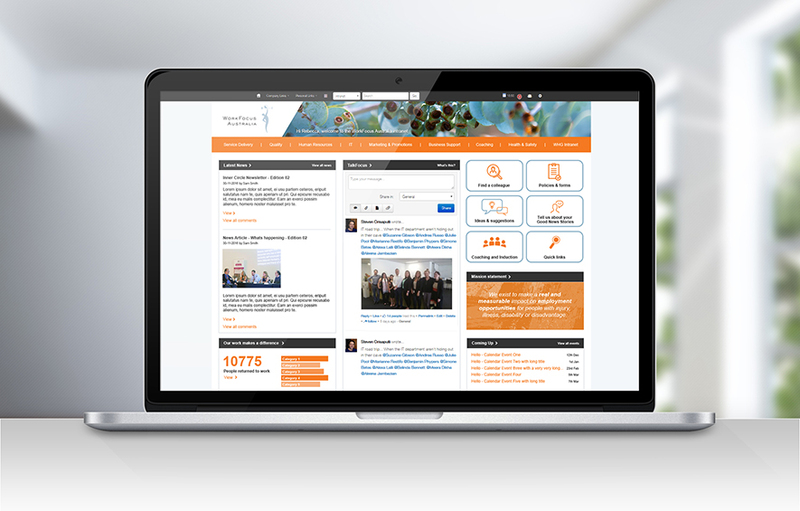 The copy and graphics work together to increase employee engagement and usage of the Intranet. This internal marketing project has been very well received. The Intranet portal is now the first option used by the bulk of employees to access information and company news. Further applications will be added to the Intranet over time.